Add this shop to my favorites. Old cane, barrel in cardboard slices, knob horn (beef) scuptée representing a dog's head, gold plated ring (punch savard doubled), vintage late nineteenth and early twentieth centuries. This cane is in good condition. The ring is hallmarked "savard doubled". A note: accidents and holes in the barrel, lack perhaps the eyes of the dog, wear of time, see photos (red arrows). We are selling a large number of old canes on this site. Height: 78.5 cm width: pommel 5.5 cm. 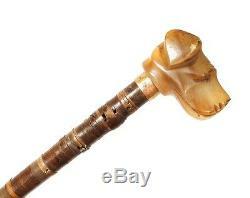 The item "old cane dog head horn rondelles carton antique cane xixème" is on sale since Wednesday, July 29, 2015. It is in the category "art, antiquities \ objects of the nineteenth and before".